This post is sponsored by Disney Press. Thank you for creating magical tales that get our kids excited about reading. It would be a gross understatement to say that our three little girls (Quinn, Clare, and Scarlet) are huge fans of Minnie Mouse. What’s not to love? She’s spunky, she’s fiesty, and she has magical adventures. Jacinda has even flown in from Texas so we could wait eagerly to visit Minnie’s home in Toon Town and get her autograph (FYI, she’s totally a sweetheart in person too). So when we were asked to review her new book, Minnie in Paris, we were happy to oblige. 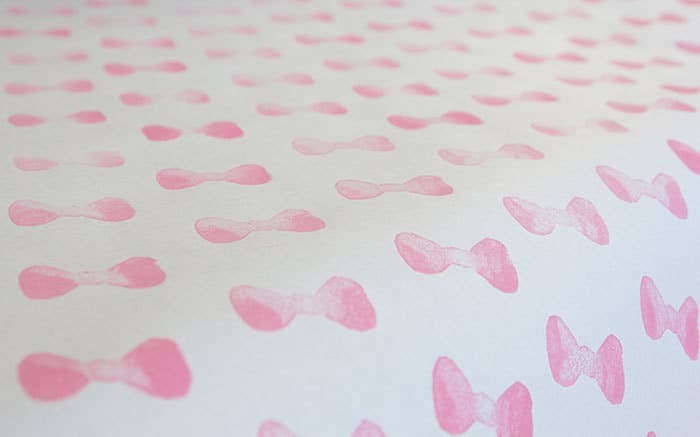 Inspired by Minnie’s iconic bow, illustrated in beautiful pink for her trip to Paris, we decided to create DIY bow stamps and use them to make this modern wrapping paper. We think Minnie would agree that our project is trés chic, oiu? I think Quinn would also agree. 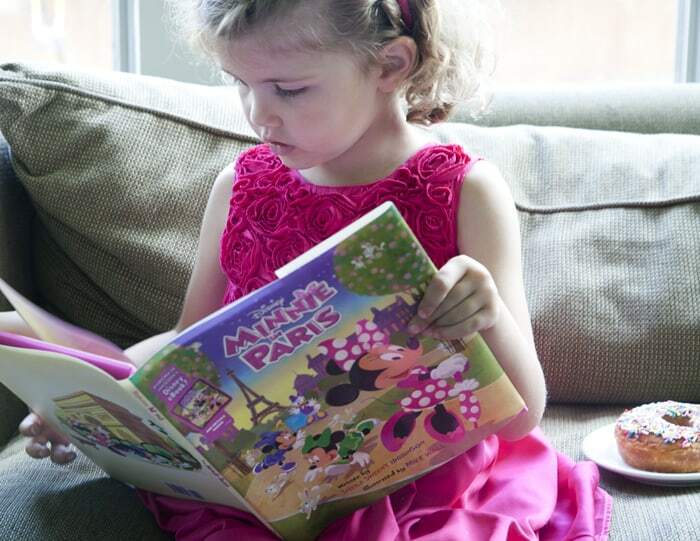 Minnie in Paris by Sheila Sweeny Higginson and Illustrated by Mike Wall is available now. Order your copy from Disney here. Quinn adores it, as will any of the little dreamers in your life. This a great little project for a summer afternoon, and you can use the stamps over and over again. 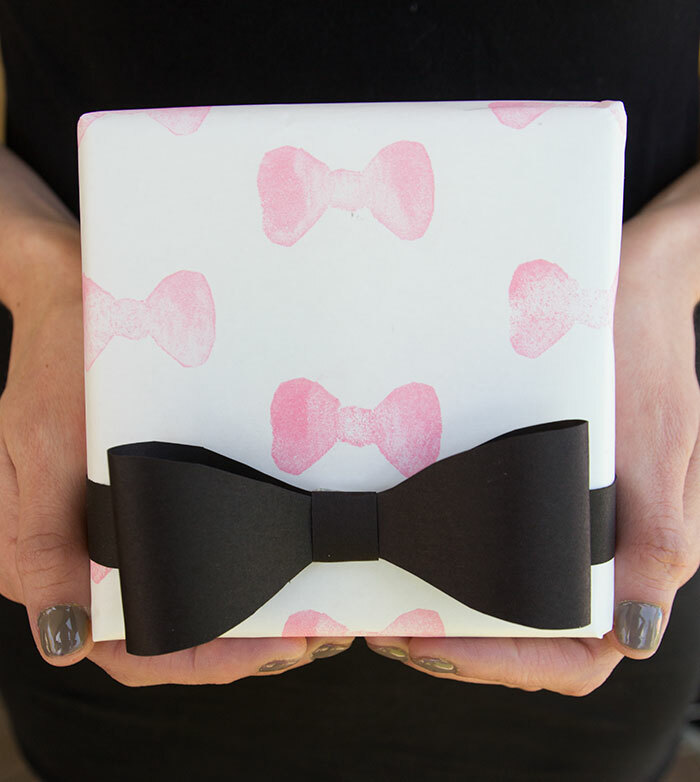 Get the full tutorial for DIY Bow Stamps and Bow Stamped Wrapping Paper after the jump. 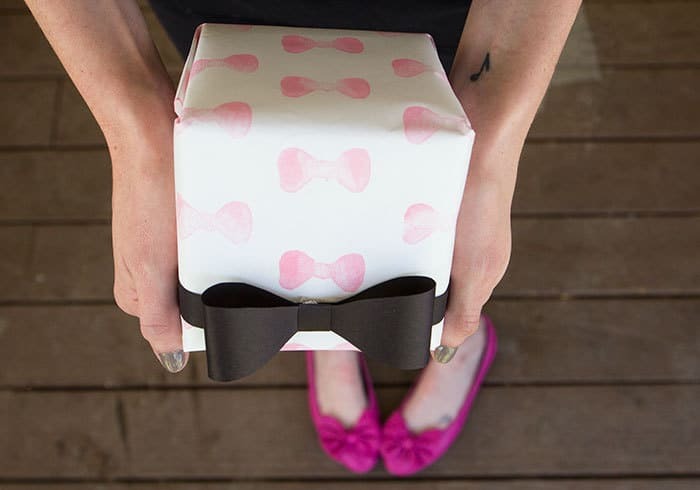 Bows Bows Bows! First up, you need some sort of base that you can turn into a stamp handle. You can use a wooden block, a piece of foam from packaging, an acrylic stamping block, a piece of cardboard… pretty much anything. 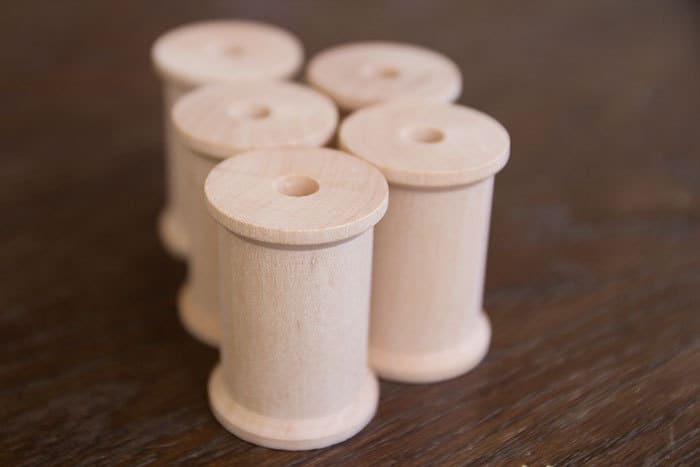 I chose wooden spools because wooden spools are cute, and I think the cylinder shape is easy for little hands to hold. Next you want to draw your design. 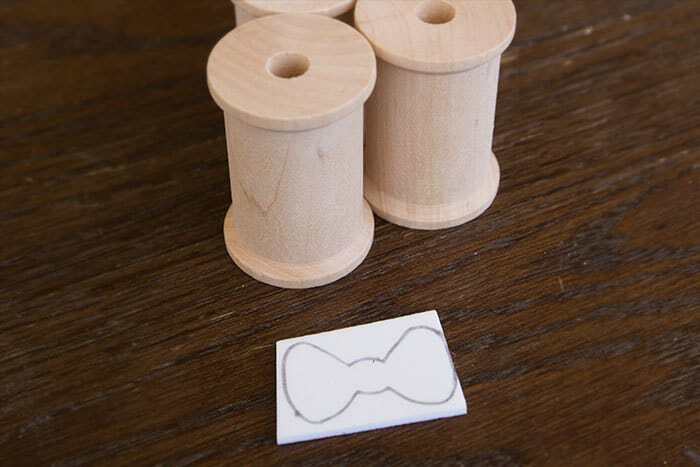 Trace the bottom of your spool (or whatever you are using as your stamp base) onto a piece of paper several times, then draw your design in the circles over and over again, until you like the way it looks. We drew a bow shape a little like Minnie’s bow, where it’s bigger on the top. When you like your drawing, cut it out and trace it onto craft foam. 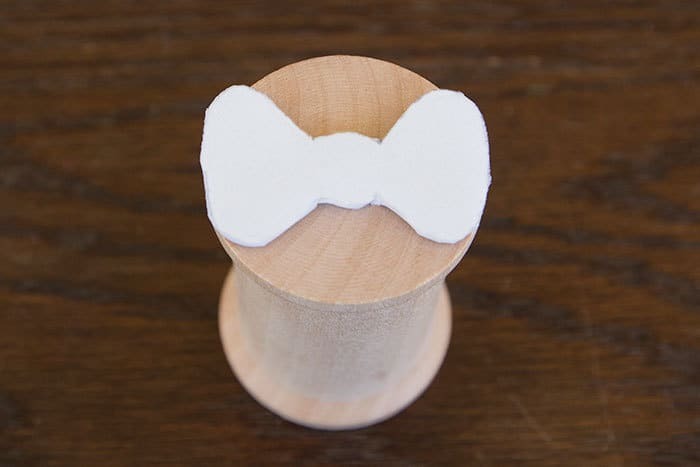 Cut your shape out of the craft foam and glue it to one flat end of your spool (or the bottom of whatever stamp base you chose). We used hot glue, but any craft glue will work. If you would like to achieve a nice even pattern of bows, use a pencil to lightly mark dots at even intervals where the center of each stamp will go. We found that stamping on white paper on top of a cutting mat is a great strategy because you can see through the paper to the measurements below. Bonus points if your BFF has sent you pencils with your name on them (thanks Jacinda!). We cut out a matching bow to put on top of the stamp, aligned with the foam stamp on the bottom, so we could see that our stamps were straight as we went. Stamp your heart out! 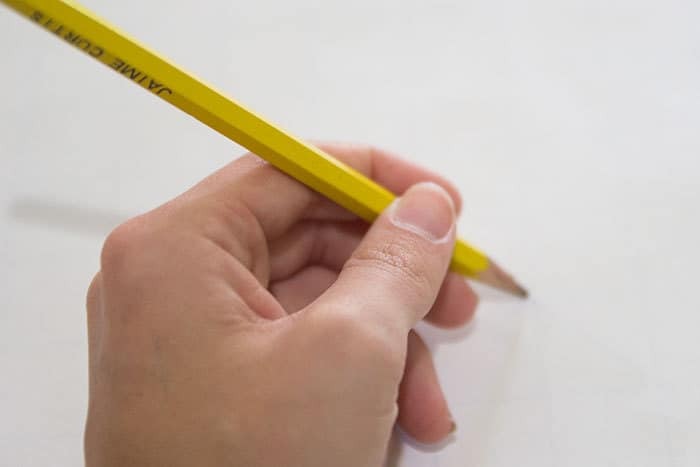 Gently, but firmly, apply your homemade stamp onto a stamp pad then press the stamp, centered, on your pre-made pencil marks. Of course stamping requires some amount of attention to detail as far as not over- or under-inking the stamp, but craft foam is surprisingly easy to use in this regard. 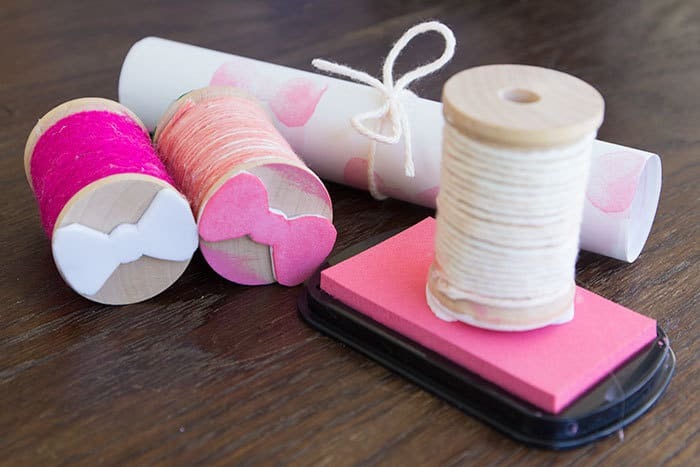 We also think a little variation in the amount of stamp ink deposited makes for a prettier look, both because you can see that your wrapping paper is homemade with love, and because it adds dimension and variation to the final product. When you are all finished, let your wrapping paper dry. Now wrap a sweet gift. We added a construction paper bow, we think Minnie would approve. Fashion is Minnie’s passion! And, as a result, she’s been invited to show her bows on the runways of Paris! At the airport, Minnie is so busy taking care of her nieces, Millie and Melody, that she accidentally switches suitcases with Penguini the magician–and finds that his suitcase is full of bunnies instead of bows! Minnie must round up the mischievous little bunnies, find Penguini, and make her bows in time for the show. Will she make it? Readers are treated to a stunning tour of famous Parisian locations, from the Louvre to Tuilleries Gardens to the Eiffel tower, to a classic Parisian bistro—all in search of Penguini’s bunnies. 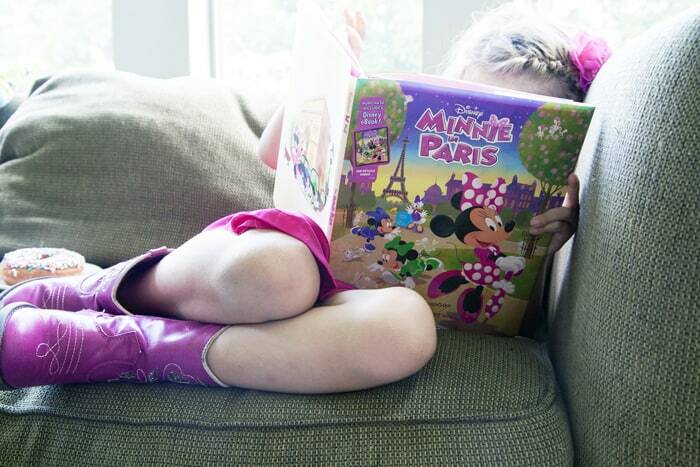 This charming hardcover picture book comes with a code to access the Minnie in Paris eBook. 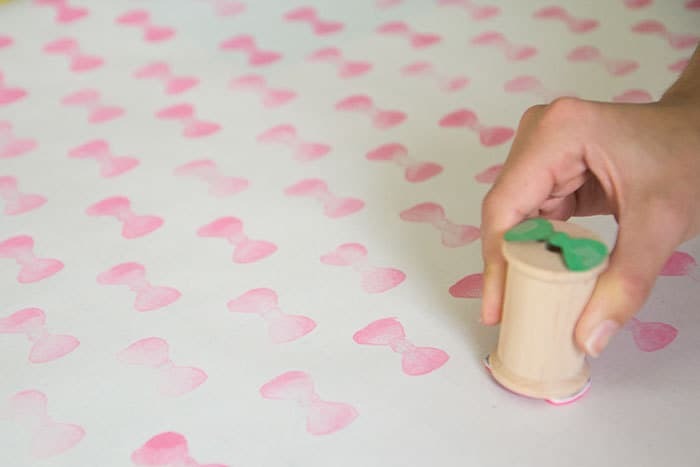 We hope you love stamping paper with your kiddos as much as we did. This post is sponsored by Disney Publishing.